Image credit & copyright: India Space Research Organization (ISRO). Live streaming links and information at the bottom of the post. LAUNCH ALERT! 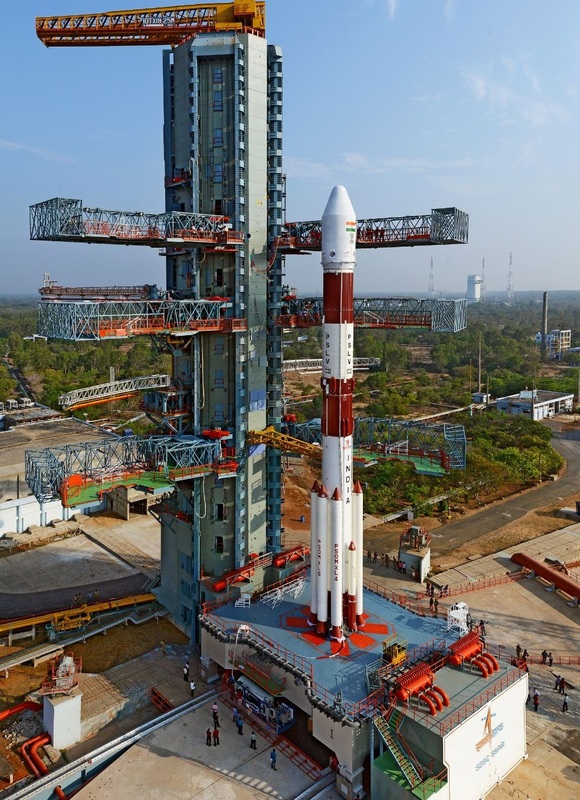 Wednesday, April 11, 2018 at 18:34 EDT (22:34 UTC), the Indian Space Research Organization (ISRO) will be launching a Polar Satellite Launch Vehicle (PSLV) in its “XL” configuration, designated “PSLV-C41” carrying the IRNSS 1I navigation satellites from the First Launch Pad (FLP), at the Satish Dhawan Space Center, Sriharikota, India. 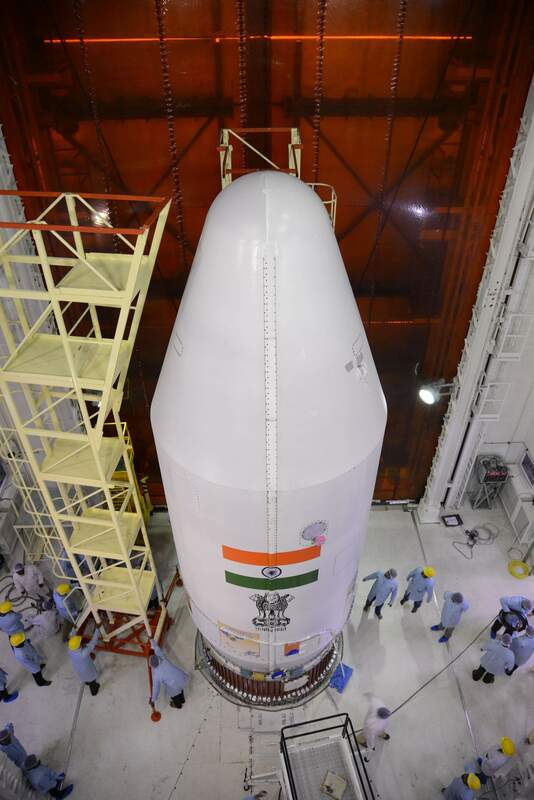 This is the 9th spacecraft in the Indian Regional Navigational Satellite System (IRNSS). The PSLV is a medium lift, 4 stage rocket standing 44 m (144 ft.) tall with a diameter of 2.8 m (9 ft. 2 in.) and is India’s space launch workhorse. It can deliver 3,800 kg (8,400 lb.) into Low Earth Orbit (LEO), 1,750 kg (3,858 lb.) into a Sun-Synchronous Polar Orbit (SSPO) and 1,425 kg (3,141 lb.) into a Sub-Geostationary Transfer Orbit (GTO). 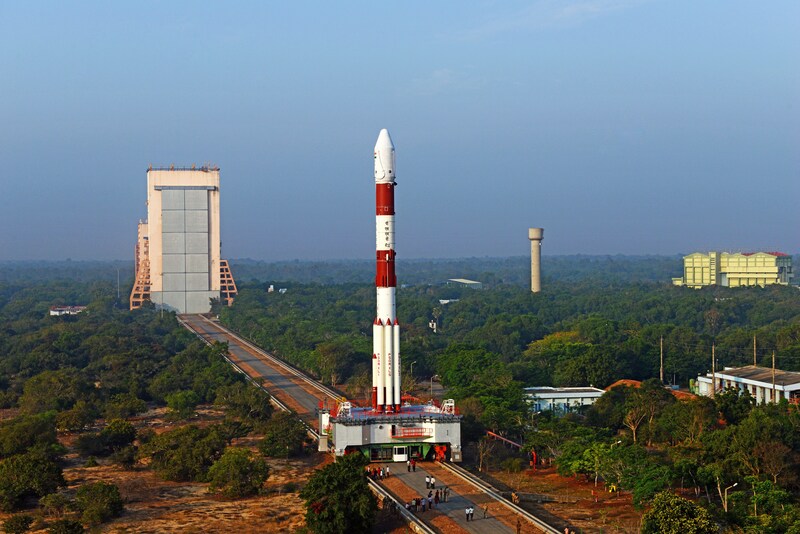 The PSLV comes in 3 variants; the “PSLV-XL” and “PSLV-G” which use six strap-on solid rocket motors, while the “PSLV-CA” is the no-booster, “Core Alone” version. Payload Fairing: The PSLV payload fairing is two-shell protective enclosure that protects the spacecraft until it is high enough to be safe from atmospheric turbulence and is 8.3 m (27 ft. 3 in.) in length and 3.2 m (10 ft. 6 in.) in diameter. Propulsion Stage 4 (PS4): Fourth (upper) stage is 2.6 m (8 ft. 6 in.) 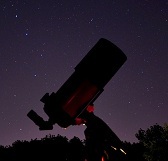 in length and 2.8 m (9 ft. 2 in.) in diameter. It’s two L-2-5 engines use Monomethylhydrazine as fuel, MON-3 as oxidizer and has a variable burn time but the high end is more than 500 seconds. Propulsion Stage 3 (PS3): Third stage is 3.5 m (11 ft. 6 in.) in length and 2.8 m (9 ft. 2 in.) in diameter. Its single S-7 engine uses HTPB solid fuel and has a burn time of 112 seconds. Propulsion Stage 2 (PS2): Second stage is 12.8 m (41 ft. 11 in.) in length and 2.8 m (9 ft. 2 in.) in diameter. Its single Vikas engine utilizes Unsymmetrical Dimethylhydrazine as fuel, Nitrogen Tetroxide as oxidizer and has a burn time of 158 seconds. Propulsion Stage 1 (PS1): First stage is 20.3 m (66 ft. 7 in.) in length and 2.8 m (9 ft. 2 in.) in diameter. Its S139 engine utilizes HTPB solid fuel and has a burn time of 105 seconds. Strap-On Boosters: The PSLV-XL and PSLV-G variants each use 6 HTPB solid fueled, strap-on boosters. 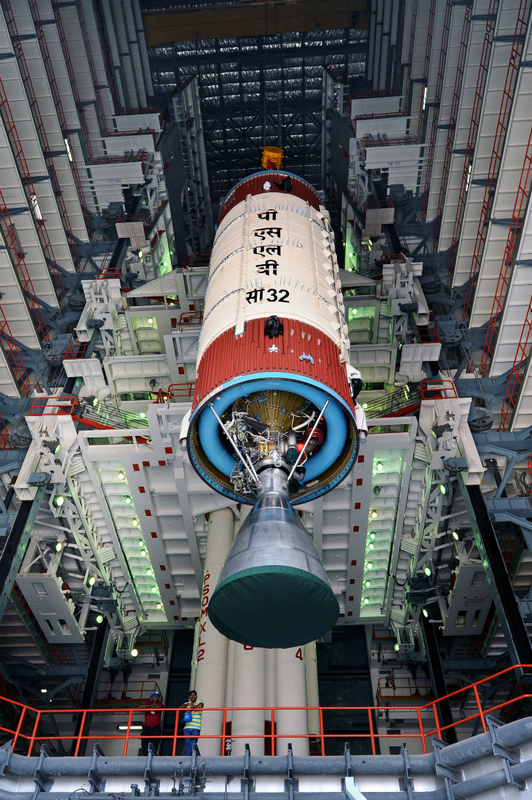 The PSLV-G uses 6 standard size boosters, each 10 m (32 ft. 9 in.) in length and 1 m (3 ft. 3 in.) in diameter with a burn time of 44 seconds. 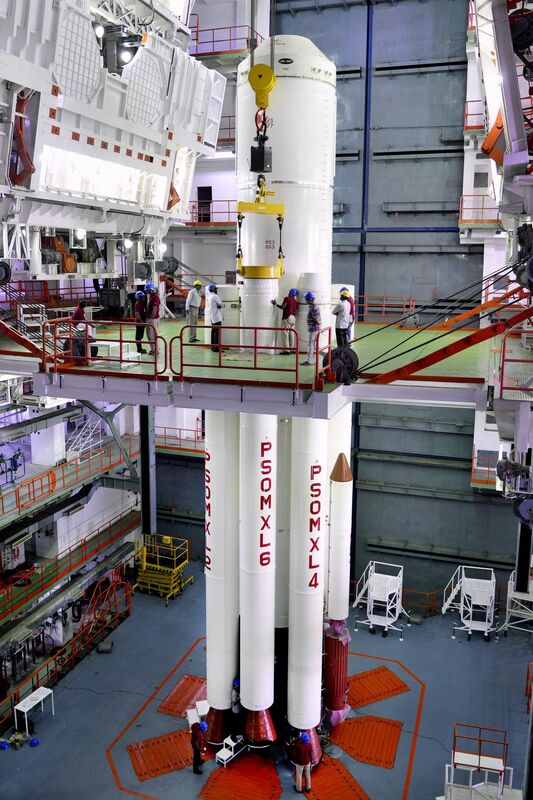 The PSLV-XL uses 6 extended boosters, each 13.5 m (44 ft. 3 in.) in length and 1 m (3 ft. 3 in.) in diameter, with a burn time of 50 seconds. Four of the six boosters ignite on the launch pad while two ignite at 25 seconds into flight. If you look at the boosters they will say PSOM but if they are “XL” boosters they will say “XL” below that. Below even that is the number of the booster 1-6. 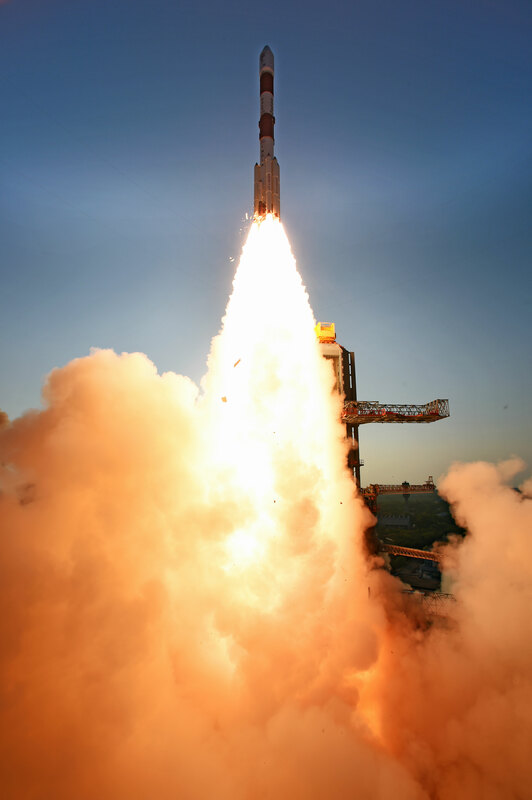 Image | This entry was posted in Images, Launches, News, Spaceflight Companies & Vehicles and tagged C41, DanSpace77, India, Indian Regional Navigational Satellite System, IRNSS 1I, ISRO, Polar Satellite Launch Vehicle, PSLV, Rocket Launch, Satish Dhawan Space Center. Bookmark the permalink.